The instrument comprises a white powder-paint coated metal base carrying a Delrin column supporting the vertical slide, operating lever shaft, and micro-switch. The vertical slide carries the probe head, secured by a clamp screw. The probe head is positioned so that the micro-switch does not pass current until the probes have made contact, lost motion ensures that the current is switched off before the probes are raised. The wafer table slides towards the operator to enable the wafer to be centrally positioned, after which the vacuum control valve can be operated to secure it in position. Annular rings allow various wafer sizes to be centered. The 6″ Multipostion Wafer Probe has circular patterns on the wafer chuck with diamters of 25mm, 50mm, 75mm, 100mm, and 125mm. The 8″ system has circles at 125 and 150mm. When the table is pushed to the limit of its travel, a measurement can be made at it’s center. Four radial positions at right-angles are denoted by a spring-loaded index ball incorporated in the rotary table. The radial distance of measurement is denoted by a similar arrangement on the linear slide index plate. Unwanted settings can be blocked off by easily removed screws. So that, for example, one could choose to measure at the center and four points at 50mm radius. 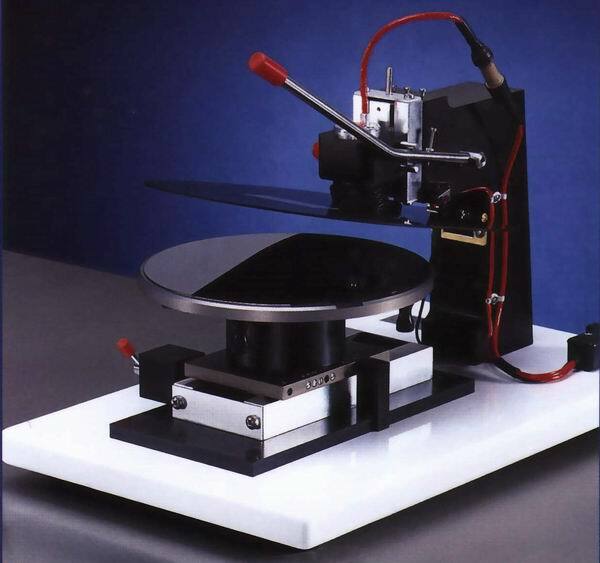 A grounded metal shield screens the wafer from light and electrical noise during measurement. It is arranged that the shield rises when the probe head is fully lifted to permit loading. Hard anodised aluminum alloy with vacuum hold, centering grooves, and tweezer notch. Preset Measurement Positions: Centre and four radii at right angles 32, 38, 50, 57, 68, and 94mm.